This evening, the Calgary Herald notified Tommy Chong of Michael Jackson's death. In his book, Cheech & Chong: The Unauthorized Autobiography, Tommy speaks about discovering Michael and The Jackson 5 in 1968 when Tommy was still in Bobby Taylor and the Vancouvers. Tommy introduced them to Taylor's record label where they met Motown's Berry Gordy, Jr. The Jackson 5 stayed at Bobby Taylor's apartment for one month and Michael Jackson shared a bed with Tommy's daughter, Rae Dawn. Tommy says that Michael Jackson “was a little guy, very small for his age . . . but he was just the sweetest, hippest little guy ever. There was nobody hipper. And he was a gentle little guy. All he cared about was singing and dancing." Tommy last saw Michael at the Grammy Awards in the '90s and says Michael was in a jokingly upbeat mood. The Cheech & Chong: Light Up America tour is coming to Cabazon, CA. Start: Wed, 07/01/09 10:00 AM local time. This weekend, Tommy Chong was on-hand for the inaugural THC Expo held at the Los Angeles Convention Center. Tommy was there representing Hippy Motors, a company owned by both Tommy and Evan Singer which converts 60's and 70's cars into more environmentally friendly green machines. Tommy was seen in his 1946 Oldsmobile Ace into the "First Fully Electric Powered Lowrider.” It comes complete with a built-in vaporizer. Warner Records has decided to discontinue three of the Cheech & Chong CDs. Pre-order the paperback edition of Tommy Chong's Cheech & Chong: The Unauthorized Autobiography. The book will be released by Simon and Schuster on August 4th (date subject to change). 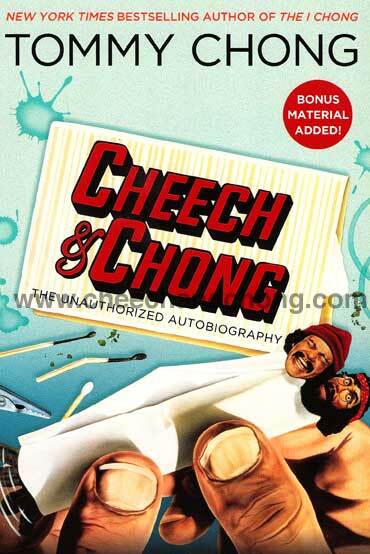 It contains BONUS MATERIAL which will include, among other things, a new chapter about the Cheech & Chong reunion which wasn't included in the hardcover edition. It also has lots of juicy Cheech and Chong and celebrity stories. One of our favorite stories is about Tommy meeting Jack Nicholson and John Lennon at a party. A/K/A Tommy Chong director, Josh Gilbert, was interviewed by a local New York television show. He discusses Tommy's wrongful persecution, marijuana laws and new government policies. Josh has also created a Special 'Rolled in Paper' Edition of the A/K/A Tommy Chong DVD.